Router bit – 1 inch diameter straight router bit. ¾ inch tall, ¼ inch shaft. 5 pieces of 3/8 inch washer with ¼ inch inner diameter to fit over shaft of router bit. Washers will act as template guide. NOTE: Routing of the spring cavity should be done by a qualified luthier. What is the difference with Trem-King tremolo than the others on the replacement market? It stays in Tune. How? The Trem King is a fixed bridge, fixed saddle system. The intonation point NEVER changes. Most other tremolos have a moving bridge, saddle, or both. 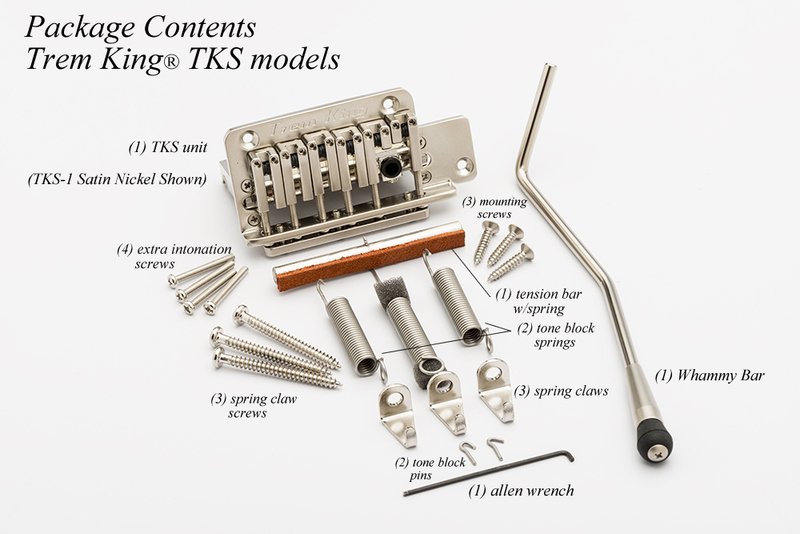 The Trem King has a stabilizing system that brings the strings back to pitch every time. When you do double string bends the tone block does not move. You can drop tune to other keys and the others strings stay tuned. When a string breaks the other strings stay in tune. You can palm mute and strings and stay in tune. Can the tremolo take heavy usage and stay in tune? Yes, by design the Trem-King will stay in tune. The unit has no negetive angles from string ball end to the saddles. The tone block is on a pivot pin and positioned behind the saddles. This is the only moving part on the tremolo. The bridge stabilizer is called the tension bar, this is the piece that controls the tone blocks position at all times. Can the Trem-King be retro fit? Yes. The system was designed to fit most tremolo routes. What does the tremolo feel like? The Trem-King has a very controlled feel. The tremolo bar is mounted directly to the tone block between the E and B strings. The position of the bar and the tone block pivot pin mount give the tremolo a smooth and precise feel. When you operate the tremolo bar up or down, the pressure of the bar is the same, soft and smooth. What kind of maintence does the tremolo system need. Periodically check the spring tension. If the system is not holding pitch, check the spring tension for the tone block and the tension bar. Adjust as necessary. Graphite pins in Saddles – The strings on a guitar with the Trem King could eventually wear a groove in the graphite pin in the saddle. Should this happen and the groove becomes too deep, remove the saddle from the bridge plate. Carefully tap the pin completely out one side of the saddle. Turn 180 degrees and re-insert carefully into the saddle. Replace saddle onto bridge plate. © Trem King, LLC., All Rights Reserved.